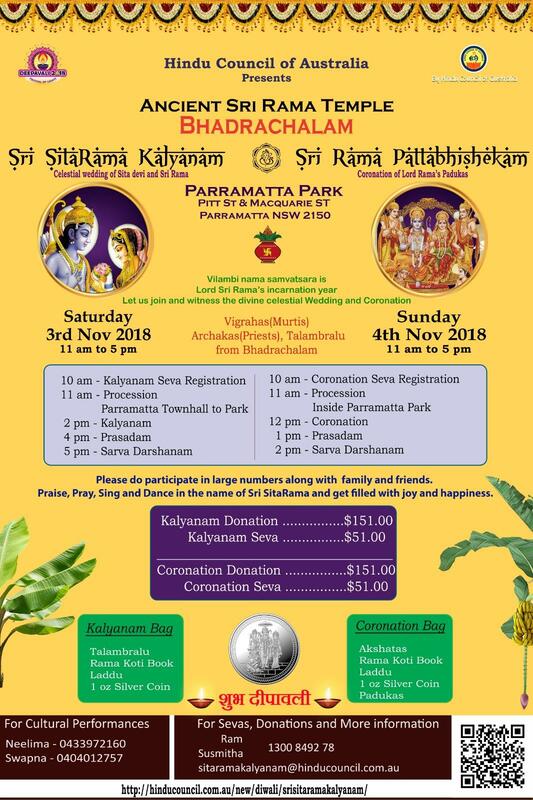 It is of great joy and delight to let everyone know that the utsava moortis Lord Sri Rama along with Sita Devi, Lakshamana and Anjeyanaya swamy are for the first time coming to Sydney from the ancient and famous Sri SitaRama temple of Bhadrachalam which is on the banks of mighty Godavari river. On this festive occasion two significant events are planned – SitaRama Kalyanam and SriRama Pattabhishekam. While Sri SitaRama Kalyanam is a blessing for every household, Sri Rama Pattatbhishekam is a blessing for entire world. Please do participate in large numbers along with your family and your friends, praise, pray, sing and dance in the name of Sri SitaRama and get filled with joy and happiness.